Made up of almost 2,000 people across four countries, we develop customer communication solutions for every part of the customer lifecycle, from start to end. One of our clients is a provider of credit cards, charge cards, and travel and insurance products. Our partnership with this corporation, which has spanned 16 years, is comprised of three main channels that offer products and services to consumers, small & medium businesses, and corporations. While our client is a large player in this market, other financial services corporations are also firmly entrenched in the market. 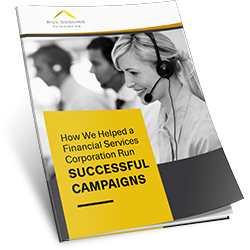 Download this case study to learn how we helped a financial services corporation run successful campaigns.